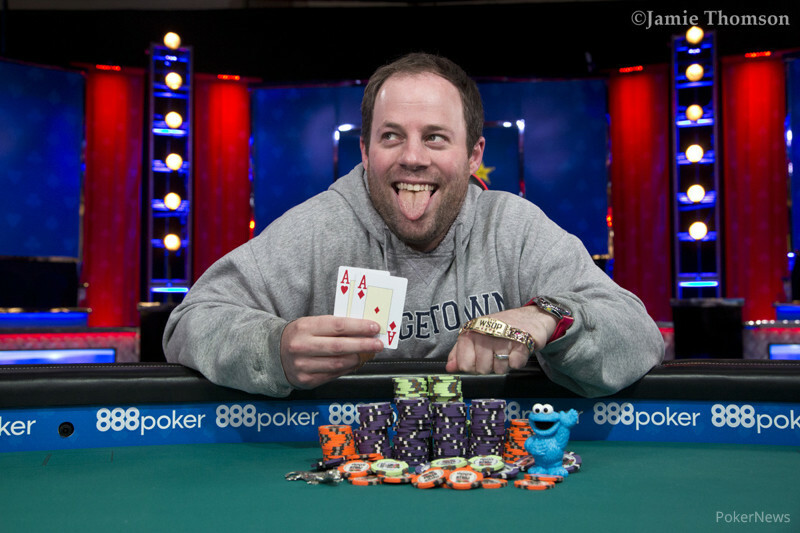 After one of the finest wars of attrition the World Series of Poker has ever seen, Jeremy Wien emerged victorious in Event #20: $5,000 No-Limit Hold'em, defeating a field of 518 players for a $537,710 payday and his first gold bracelet. "It's pretty surreal. I never really actually expected that it will ever happen but I dreamed about it," Wien said. While the field boasted a ton of great poker players, there was mainly one rival who proved to be an incredibly tough obstacle for Wien: Spanish professional player David Laka. When the two found themselves heads-up, betting on Wien would be a very long shot. Not only he was a 4-1 underdog but Laka is also a short-handed and heads-up specialist. Everything was lined up for Laka to become the champion. The 21-year-old was steamrolling the final table - until he clashed with Wien. "I'd actually played the heads-up tournament last week. It gave me a lot of confidence that I could compete against these guys," Wien said, noting that he won his first match and lost in the second round. Wien played an unorthodox style heads-up. With the full big blind ante, not many players tend to fold their buttons. Wien utilized a completely opposite strategy. Through 138 hands they played heads-up, Wien gave 32 walks to his rival. Yet, he still managed to keep his chances very much live. Each time he worked his stack back up, and while Laka downed him back to where they started, Wien just kept coming back. "I had a plan, which was to be more deliberate and folding my button. We were joking that they announced that David got a walk for a 100th time." Remarkably, Wien's comeback wasn't a case of many double ups as one would imagine as he entered most of his hands out of position. Wien needed help only once when he got it in preflop with ace-nine against pocket tens, facing his elimination. An ace on the flop saved him in the tournament, pushing him to the lead. Since then, it was anyone's game as both players were mostly neck and neck and the lead kept switching back and forth. It took over four hours until the heads-up culminated. With increasing blinds, the stacks were as shallow as 25 big blinds on average. Then it happened: Laka was dealt pocket queens while Wien peeled aces. They didn't stuff it in pre, but the cards were turned on their backs on a jack-high flop. Aces held and Wien had his opponent barely covered to finally tackle him. "He did tell me at the last break that he's a heads-up specialist," Wien said, adding that he tried not to look up at the players he was facing off against. "Obviously, I know who Jake Schindler and David Peters are." "I have a style that's very different than them," Wien said. "I'm very nitty. It's a little different heads-up but in general, throughout the tournament, I played pretty tight and tried to pick my spots. It worked this week." The heads-up took almost half of the whole final table play. The eight-handed final table started with players guarding fairly shallow stacks and it was likely that the deadlock would break soon. Richard Tuhrim couldn't gain any traction and left in the first level, but the tournament would hit a stalemate for a bit. Then, in level 29, three players were eliminated in the span of just four hands. First, Peters and Shawn Buchanan fell to David Laka in seventh and sixth place, respectively. Buchanan's exit looked to be the key moment of the final table. The Canadian pro raised and then four-bet shoved fives into jacks and Laka had just enough chips to send him to the rail, winning the tournament's largest pot at the time. After Peters and Buchanan were gone, Eric Blair knocked out John Amato on the very next hand and suddenly only four men were sitting at the table. Laka soon took care of Jake Schindler in a huge cooler that saw Schindler's kings getting cracked by ace-king on the river, propelling Laka into a commanding chip lead. Blair and Wien put up very little resistance to the leader who at one point won 11 out of 12 consecutive hands. Blair dropped to a short stack and lost his chips to Laka who appeared unstoppable until he found himself up against Wien. When the scheduled 60-minute dinner break arrived, despite being hungry, Wien's plan was to skip the break so he wouldn't have to give his opponent time to study previous hands. "I was initially thinking: 'Let's get a dinner break, let's relax, let me regroup," Wien admitted. But then he realized that he'd played a very tight table image through the whole tournament and didn't want to let Laka find out about some of the gutsy plays he'd made heads-up. He may have starved through, but the reward was truly sweet. Now that he's a bracelet winner, Wien plans to come back for the tag team event and try to win another gold together with his wife. 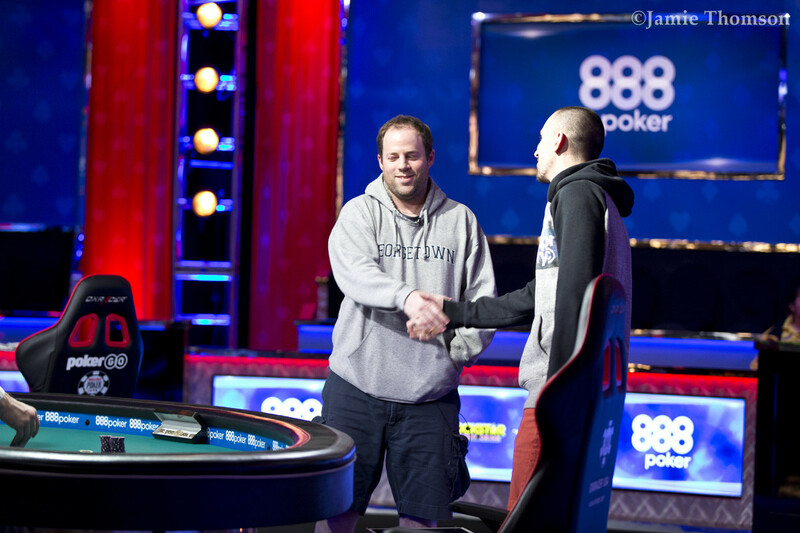 Hand #290: Jeremy Wien limped and David Laka made it 840,000. Wien called the raise and they went to the flop. Laka fired 1.25 million and Wien processed the situation for well over two minutes before check-raising to 2.5 million. Laka shoved all in and Wien called. Both players had been dealt a high pair and after six minutes, the cards were turned on their backs. Laka was in a bad shape and the turn and river didn't help him. Wien had him slightly covered and just like that, the gruelling heads-up was over. 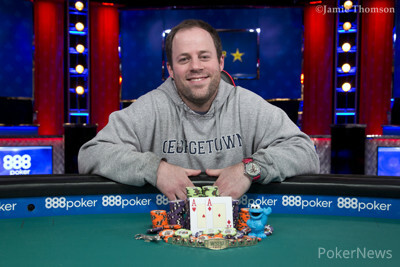 David Laka took home $332,328 for his runner-up finish while Jeremy Wien is the newly crowned champion, joining the WSOP bracelet winners' club. Hand #285: Laka completed in the small blind and Wien checked. The flop was , Wien checked and Laka bet 265,000 with Wien making the call. The turn brought the Wien checked and Laka bet 1,150,000 and Wien folded. Hand #286: Laka received a walk. Hand #287: Laka opened to 480,000 and Wien moved all-in for 5,460,000 and Laka folded. Hand #288: Laka received a walk. Hand #289: Laka completed from the small blind and Wien checked. On the flop Wien checked and Laka bet 325,000 and Wien called. The turn of the saw Wien check again with Laka checking behind. The river brought the and Wien checked and Laka thought for a few seconds before checking as well. Wien showed for a rivered pair of sixes and Laka mucked. Hand #280: Jeremy Wien shoved the button and David Laka folded, allowing his rival to virtually tie him in chips. Hand #281: Laka called and folded to Wien's shove. Hand #282: Laka received a walk. Hand #283: Laka limped but Wien pushed all in again, forcing another fold from the Spaniard. Hand #284: Wien limped this time and Laka raised to 1.65 million. Wien didn't have it. Hand #275: Laka opened to 480,000 and Wien jammed all-in for 3,510,000 and Laka folded. Hand #276: Wien opened to 525,000 and Laka folded. Hand #277: Laka opened to 480,000 and Wien called. The flop showed Wien checked and Laka checked back. The turn brought the Wien check-folded to a bet of 350,000 from Laka. Hand #278: Wien completed in the small blind and Laka raised to 1,250,000 and Wien then shoved all-in for 3,990,000 and Laka folded. Hand #279: Laka opened to 480,000 and Wien shoved 5,240,000. Laka folded. Hand #270: Jeremy Wien gave another walk to David Laka. Hand #271: Laka limped and Wein checked his options. Laka claimed the pot with a bet of 325,000 on a flop of . Hand #272: Wein made it 625,000 and Laka defended his big. Wien fired a 1,100,000-cbet on the flop and Laka called again. The turn was the and Wien barreled, firing 1.65 million. Laka paused for a moment and then moved all in, forcing a fast fold from Wien who was left with 2.8 million. Hand #273: Laka min-raised but quickly folded when Wien jammed his last 13 bigs or so. Hand #274: Wien shoved once again and Laka didn't find a hand that would fit in his calling range. 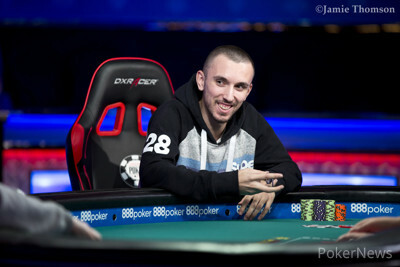 Hand #265: David Laka limped in and Jeremy Wien made it 700,000. Laka folded. Hand #266: Wien limped and Laka raised to 1.5 million, prompting a fold from Wien. Hand #267: Laka raised and won the pot preflop. Hand #268: Wien threw in 550,000, Laka called and then check-folded to a bet of 400,000 on a flop. Hand #269: Laka raised to 400,000 and Wien folded for one last time in this level. The players headed for a 15-minute break. The average stack will be worth just over 25 big blinds when they come back. Hand #260: Laka received a walk. Hand #261: Laka completed from the small blind and Wien checked. The flop came Wien bet 250,000 and Laka folded. Hand #262: Laka received a walk. Hand #263: Laka raised to 400,000 and Wien folded. Hand #264: Laka received a walk.